Nearly 50 years to the day after Dr. King wrote his passionate plea for unity, justice and nonviolence from his prison cell in Alabama, on the afternoon of Monday April 15, 2013, two homemade bombs were detonated near the finish line of the Boston Marathon. The blasts murdered three people – including an eight-year-old boy – and injured at least 150 more. The very same day, a "wave of bombings across Iraq…killed at least 33 people and wounded more than 160 others," reported Al Jazeera, the most deadly of which occurred in Baghdad, Fallujah, and Kirkuk. A suicide bomber killed another 32 people in a popular Baghdad internet cafe today. A number of car bomb attacks also took place in Somalia, Pakistan, and Bahrain this week. 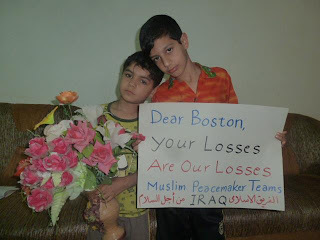 The news of the Boston bombing spread around the world within minutes. Condemnation of the appalling act was immediate, sympathy and solidarity ubiquitous. Meanwhile, hardly anyone heard about the attacks, let alone the myriad deaths, in Iraq and elsewhere. By Tuesday, a remarkable and arresting photo emerged online, posted first by the Facebook group "America Loves Iraq." 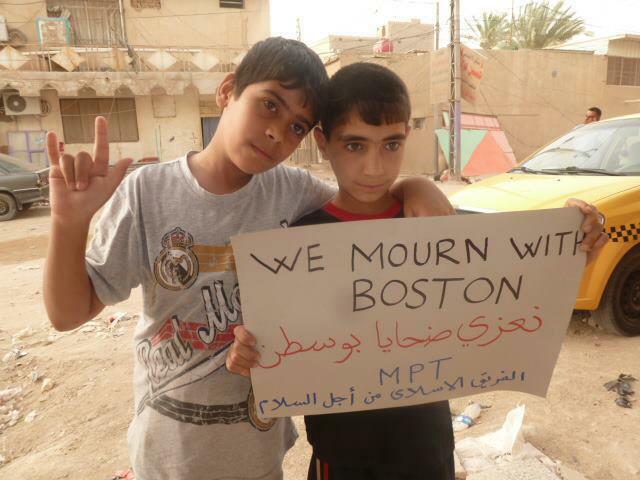 The photo, provided by the peace and human rights organization, Muslim Peacemaker Teams (MPT), shows two young Iraqi boys holding a handwritten sign reading "We Mourn With Boston" in both English and Arabic. A similarly powerful photograph was posted the same day by MTC founder and director Sami Rasouli. The boys not only stand in solidarity with the victims of the Boston explosions, but they also empathize because this is what they’ve experienced. Part of this message is being shared with Americans because they want them to know they understand the pain Americans are going through. Associated Press reporter Laura Jakes, who served as the wire service's Baghdad bureau chief from 2009 to 2012, wrote this week that "the blood-splattered streets and frantic screams of confused bystanders could have been in Baghdad on any given day. But it was Boston, in an affluent area surrounded by world-class security forces, where deadly roadside bombings aren't supposed to happen." "In Iraq," Jakes explained, "roadside bombs are a near-daily way of life. They are heartbreaking, scary, and devastating" and "have sucked the confidence and hope from Iraqis who never know when it is safe to go out." Gosztola points out that it is now, in the wake of the tragedy on Boylston Street, "in the moment when people are most paying attention," that we all must remember "that there are other people around the world, who suffer from violence daily," oftentimes committed by the U.S. government itself. The photos of these beautiful Iraqi children, victims themselves of the consequences of American Empire, stand as a testament to the boundless human capacity for compassion, dignity, forgiveness and solidarity. "We are all citizens of the world and our pain can bring us together," concludes Gosztola, and so should we all.